Big, brave and team oriented to a fault, Jason Cloke was the first of David and Julie Cloke’s three sons to follow in their father’s footsteps and pull on a Black and White jumper. Jason’s career is remembered both for his outstanding debut season in 2002 and the suspension that ended it just one week before the Grand Final. 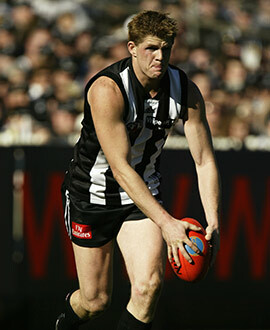 Cloke joined Collingwood under the father-son rule in the 2000 National Draft after playing his junior football in Melbourne’s eastern suburbs. After spending 2001 at Williamstown, Cloke made his senior debut against West Coast in round two of the following season and never looked back. Cloke was not the only debutant at the MCG that afternoon – Chris Judd, a future dual Brownlow Medallist, also shared that honour. Wearing the No. 34, one number higher than his father, Cloke impressed all football followers with his courage, contested marking and ability to read the play, acting as a key figure in Collingwood’s best season since the 1990 premiership. His best match came against the Western Bulldogs at Docklands in round seven. Cloke played in his customary role as a loose man across half back, earning Brownlow votes for his 23 disposal performance as the Magpies recorded a thrilling seven point win. He also earned rave reviews for his courage in wet conditions on ANZAC Day, when he marked bravely in front of Essendon’s Matthew Lloyd during the third quarter. By the time September rolled around, Cloke was barely 20 years old. He performed solidly against the Power in the Qualifying Final, but disaster struck against the Crows in the Preliminary Final a fortnight later. Cloke was reported for striking Adelaide’s Tyson Edwards in the second quarter, his blow knocking Edwards to the turf in a marking contest on the Members’ flank. Despite an emotional appeals process, Cloke would be suspended for two matches, meaning he would miss the Grand Final against Brisbane. The Magpies went down by just nine points in the sort of wet conditions Cloke revelled in on ANZAC Day just a few short months earlier. The day was not without its joy, though, for Cloke’s younger brother, Cameron, was a member of the Eastern Rangers’ first ever TAC Cup premiership team in the curtain raiser. Cloke came out firing in the following season, but appeared to lose confidence as his team battled a form slump. He was omitted after ANZAC Day and his form fluctuated from there on. Fortunately, he found his best form when it matter, performing well in finals wins over Brisbane and in particular Port Adelaide, when he was instrumental in Collingwood’s 44-point win in the Preliminary Final. Football romantics declared Cloke’s time had finally arrived, with no tribunal or media to distract him this time around. But on Grand Final day, Cloke began the match cast in the unfamiliar role of centre half forward. In the absence of the suspended Anthony Rocca, coach Mick Malthouse chose Cloke as the man to fill the void. Unfortunately Cloke was unable to produce his best form in foreign territory as the Magpies fell to a 50-point loss, and his positional change was the subject of fierce media debate in the hours that followed. Cloke returned to his best in 2004, with his confidence restored after a heartening mid-season patch where he quietened Melbourne’s David Neitz on the Queen’s Birthday and played a hand in wins against Adelaide, West Coast and North Melbourne. He fell out of favour the following year, dipping in and out of the side as Malthouse rejigged his backline. James Clement, Simon Prestigiacomo and Shane Wakelin were its staples, and a young man named Nick Maxwell their able assistant. Although he finished the year in the seniors, Cloke claimed the Joseph Wren Memorial Trophy as Collingwood’s best performer with Williamstown in the VFL. In a bid to revitalise his career, Cloke upped his fitness during the 2005/2006 pre-season and began the NAB Cup in fine fettle, starring in a thrilling win over St Kilda at Docklands. He opened the season on the wing against Adelaide but his NAB Cup form deserted him as the Crows ran out to a 34-point win. He was used as a relief ruckman for Josh Fraser against the might of West Coast’s Dean Cox in round seven but did not reappear until round 15, when he was pitted against Fremantle’s Matthew Pavlich at full back. Although Pavlich kicked four goals Cloke was not disgraced, and produced his best game since 2004 against the Hawks a week later, when he had 18 disposals in a 45-point win. The thrilling two-point win against Port Adelaide in round 20 marked Cloke’s final appearance at the highest level. He nominated for the draft after his delisting and trained with Essendon ahead of the pre-season draft, only for the Bombers to plump for Mal Michael at the last minute. With his AFL career over, Cloke carved out a fine career with Western Region Football League club Spotswood, and turned out for a Collingwood in a Legends Match against Carlton in 2014.